1950s advice on road accidents. Homepage. 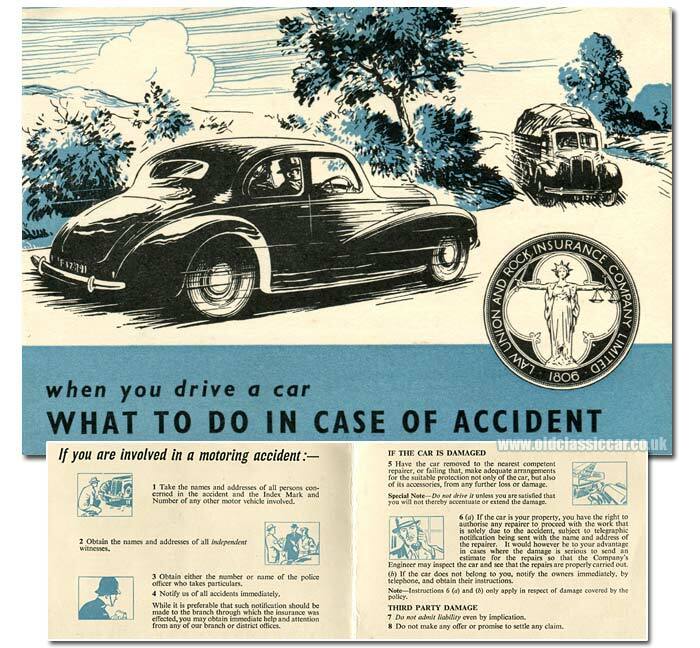 This page: An information leaflet designed for the 1950s motorist regarding accidents. "What to do in case of an accident". If I've deciphered the code on the reverse of this small leaflet correctly, then this pocket-sized publication dates to October 1951. It was issued by the Law Union & Rock Insurance Company Ltd, of Chancery Lane in London, as a handy "aide-memoire" for anyone unfortunate enough to be involved in an accident. The front page has an illustration of a chap - wearing a hat as all properly-attired drivers should - speeding along in his motor-car, while appearing around the bend is a lumbering old lorry, laden with cargo, for some reason driving on the wrong side of the road. Any second now both drivers might need the advice given in this leaflet, unless avoiding action is swiftly taken. Despite its age, the leaflet is in surprisingly good condition, my guess is that it has spent the last 60+ years at the bottom of a drawer somewhere, out of the sunlight. Items like this are fun to collect, inexpensive, and shed light on what it must have been like to live and be a motorist, at that time. Turn the page and advice on what to do in the event of a shunt is given. This includes taking the names and addresses of everyone involved, and also details of all vehicles that became embroiled in the roadside kerfuffle. Witness details should also be gathered too, the reader is advised, as should the number and/or name of any police officer that intervened in proceedings. With the information all noted, it was then time to advise the insurance company directly, either through the branch at which the policy was instigated, or at any other branch throughout the land. Nowadays I'm sure we'd be told to photograph the scene on our mobile phones, although interestingly then - as now - the advice is not to admit liability to anyone regarding the incident, even if that was the case. No doubt a modern-day leaflet would also contain advice on taking legal action for personal injury against the other motorist(s) involved. Then though, the priority was to see that everyone involved was ok, then seek a competent car repairer to effect repairs as were deemed necessary. Photographs of older cars that have been involved in collisions that feature elsewhere on the site, include these shots of a bent Morris Cowley of the 1950s, a vintage Austin 12/4, and a rare Ford Prefect E93A drophead coupe.